The origins of Caribbean Stud Poker are a little bit murky but it appears to have emerged in the United States in the early 1980s as a variant of stud poker. It’s full title seems to have been coined in Aruba some years later with some small rule variations. Stud poker is a version of poker in which there is no draw or community cards; the cards you have are the cards you use. 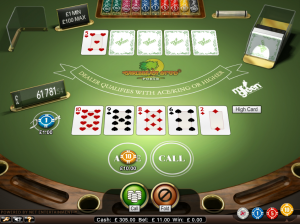 The aim of Caribbean Stud poker is to create the strongest five card hand according to standard high poker rankings. This game also features an optional progressive jackpot for an extra fee. Players are competing against the dealer and not each other here; an ante is used to get the betting started and an optional bet can also be made if a player would like to have a shot at the progressive jackpot prizes. The dealer now distributes five cards face down to each player and he receives five himself. The dealer the turns over one of cards so it is visible to all. Players may now decide whether to fold or continue with their hand. If they want to play on an extra bet twice the size of the ante must be added. Hands are now compared but the dealer must first qualify to play; he must have a king or ace in his hand, otherwise the player wins double the ante back and any other placed bets. A tie results in a push with all bets returned to players. Variable cash prizes will be paid out for weaker hands.